Grace joined Watsi on March 10th, 2015. 17 other people also joined Watsi on that day! 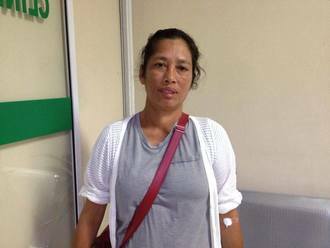 Grace's most recent donation traveled 2,800 miles to support Benita, a housewife from Philippines, to fund thyroid surgery. Grace has funded healthcare for 9 patients in 4 countries. Benita is a 55-year-old mother of four who stays home and cares for her grandchildren while her children are at work. She prepares meals for the whole family and does chores. She lives in the Philippines. After the birth of her fourth child, Benita experienced difficulty swallowing and a heavy feeling in her chest. She avoided seeking care because she knew the cost would be a burden on her family. Over time, her condition has gotten worse, and she now has a lump on her neck that is tender and painful. She has had this condition for six years. After a series of lab tests, Benita was diagnosed with a multinodular goiter, a thyroid condition in which the gland is swollen and produces excess hormones. She needs surgery to remove her thyroid gland and prevent her symptoms from getting worse. The cost of Benita's surgery, scheduled for February 8, is $1,500. Her husband works as a farm laborer and cannot afford this procedure, so they are seeking help from Watsi. "I really don't deserve this kind of blessing, but I am very grateful that I was given a privilege to be treated," Benita says. "Though we are not that rich, the simple joy and happiness given by my family, especially my grandchildren, are more than enough for a lifetime. This gift was just a bonus in my life, and I am thankful that you are giving me a chance to enjoy life more." Maung Chit is 43 years old and the father of a large family. He lives with his family in Burma. He works very hard as a day laborer, employed by several large farms. In April 2016, Maung Chit experienced an accident while unloading timber from a wagon. A portion of the load fell on top of him and broke his right leg above the ankle. In June 2016, he made the four-hour journey to a clinic, where an X-ray of his leg was taken. He was referred to our medical partner, Burma Children Medical Fund (BCMF), to examine the large bulge on his leg, which was preventing him from walking. In December 2016, Maung Chit underwent an internal and external fixation surgery. Maung Chit now needs another surgery to remove the rod placed during his first operation. Our medical partner, BCMF, is requesting $1,500 for this procedure. Thyda is a 13-year-old primary school student. She has three sisters and one brother, and she is the youngest of her siblings. She likes drawing and watching TV in her free time. For two years, Thyda has experienced ear discharge and buzzing in her right ear. She was treated with ear cleaning and a nose rinse, but her symptoms did not improve. Another organization, All Ears Cambodia, referred her to our medical partner, Children's Surgical Centre (CSC). Surgeons at CSC will perform a mastoidectomy to remove an abnormal growth, a cholesteatoma, from her ear. Her treatment is scheduled for February 13. However, Thyda's family cannot afford this treatment, so CSC is requesting $842. Thyda's grandmother hopes that she will feel better and hear easily. Htwe is a 35-year-old wife and mother from Burma who works as an agricultural day laborer. She lives with her three-year-old daughter, husband, and extended family. Two years ago, Htwe began to feel a lump developing in her lower abdomen. As the lump progressed in size, she began to experience severe back pain, eventually finding it unbearable to work. After two and a half years of intense pain, Htwe and her husband decided to seek treatment in January 2017. They were referred to our medical partner's care center, Mae Sot General Hospital (MSH), where an ultrasound and other tests revealed that Htwe has a myoma, a benign, non-cancerous tumor in her uterus. It was recommended that she undergo surgery to remove her entire uterus. Our medical partner, Burma Children Medical Fund, is requesting $1,500 to fund a total abdominal hysterectomy on February 2. 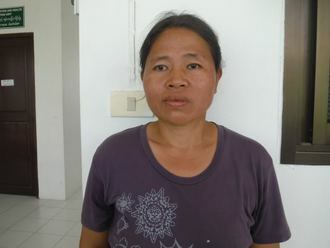 Due to Htwe and her husband’s inconsistent sources of income, they are unable to pay for the surgery without support. This family-focused mother hopes to return to her job after her surgery and support her daughter’s future. “I want to work hard to save money for my daughter’s education. I want my daughter to become a teacher or a nurse when she grows up. I don’t want her to do hard work like me,” she shares. Narin is 60 years old and married with two daughters and five grandchildren. She likes to watch comedy programs on TV and listen to monks pray on the radio. Three years ago, Narin developed a cataract in each eye, causing her to have blurred vision, pain, cloudy lenses, and extreme sensitivity to light. It is difficult for her to see things clearly, recognize faces, do any work, and go anywhere outside on her own. Finally, Narin learned about our medical partner, Children's Surgical Centre (CSC). She traveled for one hour with her daughter to reach CSC for treatment. She is scheduled to undergo cataract surgery on February 3. However, she cannot afford this treatment. CSC is requesting $292 to help fund her procedure. After her procedure, Narin will be able to see clearly again. Narin says, "I hope I can see everything more clearly than now so that I can help my daughter at home and go to the pagoda or anywhere else outside by myself." Meet Eng, a 76-year-old mother to three daughters and grandmother to four grandchildren. She likes to garden and plant flowers in her spare time. Two years ago, Eng developed a cataract in both eyes. It is difficult for Eng to see things clearly, do work, or go anywhere on her own. Eng is worried about going blind in the future. Eng traveled for two hours with her daughter to reach our medical partner, Children's Surgical Centre, for treatment. On March 20, doctors will perform a small incision cataract surgery and intraocular lens implantation to remove Eng's cataracts. With $292, we can help Eng to see clearly again!